Goodbye, Pony Express. Hello, Transcontinental Railroad! Has FrontierVille been running slower than a pack mule? Zynga is offering a hard drive install for disgruntled players that claims to improve performance. Even with all the performance enhancements recently, the game still runs like a snail in molasses purely because of all the content introduced to the game weekly. How does it work? Well, Zynga will install nonessential FrontierVille files like sounds and artwork into a folder on your hard drive. Then, every time you boot up the game on Facebook, it will load these files locally from your computer rather than over the Internet. 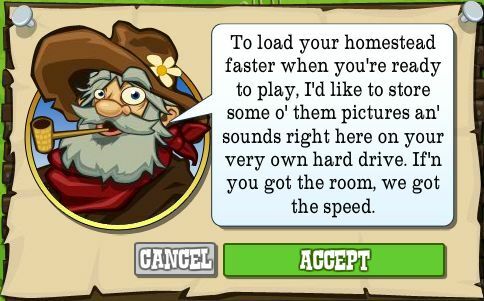 This, in theory, will boost the loading speed when not only jumping between homesteads and initially loading the game, but while moving around the environments as well. However, the speed boost has yet to be offered on our end, so sit tight for our impressions. In the meantime, FrontierVille Info reader Alexander Cain says that he won't touch the optional installation with a ten-foot pole. ""Zynga wanting to put crap on my hard drive? I can't stand them as they are already, I said 'no' this this, there is no way I will ever trust this company to place items on my hard drive," said Cain. "I don't care how fast the game will run, this company will never see one byte or bit of data on my computer." Well, it's probably a bit too late for that considering recent trends, but he raises a valid point. Who knows whether this will allow Zynga to see even nonessential data on our machines--is that worth a faster FrontierVille? Do you plan to accept the hard drive install from Zynga? Do you think Zynga is overstepping their bounds with this offer, or is it all in the sake of a better game? Sound off in the comments. Add Comment.